(NaturalNews) Mexico and Canada have succeeded in a joint effort to strike down an American regulatory policy passed in 2008 that requires country-of-origin labeling (COOL) on meat sold in the U.S. Public Citizen reports that the World Trade Organization (WTO) has ruled against the U.S. in a case regarding the matter, a move that will potentially expose millions of Americans to “mystery” meat from unknown origins. As a member of the WTO, and now the ominous Trans-Pacific Partnership (TPP) that allows foreign companies to bypass the American legal system (http://www.naturalnews.com), the U.S. is bound to certain international trade rules that supersede its own sovereign laws. These rules prohibit WTO member countries from engaging in so-called unfair trade practices that discriminate against other WTO member countries. In this particular case, Mexico and Canada filed a dispute with the WTO claiming that U.S. Department of Agriculture (USDA) meat labeling requirements deviate significantly from international standards, and unfairly discriminate against WTO member countries. COOL requirements end up making it easier for U.S. meat packers to source meat from domestic animals rather than foreign ones, for instance, which Canada and Mexico say puts the U.S. at an unfair economic advantage. Mad Cow Disease (the common term for Bovine Spongiform Encepholopathy (BSE) made headlines once again in April 2012, when a dairy cow at a rendering facility in California was found to have the disease. BSE, a progressive neurological disorder of cattle that can be transmitted to other species, including humans (in people it’s called Cruetzfeldt-Jakob Disease) is a devastating condition that typically leads to progressive dementia and death, often within a year of the onset of symptoms. One of the primary ways Mad Cow Disease is transmitted is when cows are fed bone meal and waste products from other cattle infected with the disease. Chicken litter, a rendered down mix of chicken manure, dead chickens, feathers and spilled feed, is marketed as a cheap feed product for cows. The beef industry likes it because it’s cheaper than even corn and soy, so an estimated 2 BILLION pounds are purchased each year; yes, this is a very serious amount of this product being fed to animals. As if the idea of your burger being the product of manure and feathers isn’t unsettling enough, about one-third of the chicken litter concoction is spilled feed, which includes cow meat and bone meal often used to feed chickens but which is supposed to be off limits for cows. However, any cow that eats chicken litter may also be consuming various beef products intended for chickens – the very same feed products that spurred the Mad Cow Disease outbreak in the first place! And it’s not only the spilled feed that’s the problem; the infectious agent can also be passed through the chicken manure as well. It sounds like once again profits have won out over public safety, and while cases worldwide have declined dramatically (from a peak of 37,311 cases in 1992 to 29 cases in 2011), allowing cow parts back into cattle feed, albeit indirectly, could easily reverse this progress. But U.S. regulators are still only testing 40,000 of the 35 million cattle slaughtered annually … it was only by happenstance that the 2012 case was detected as part of the USDA’s surveillance program for cattle. Only just over 0.1 percent of U.S. cattle are tested prior to entering the food supply, so there’s really no way of knowing how many cattle with Mad Cow Disease might end up on dinner plates. “U.S. 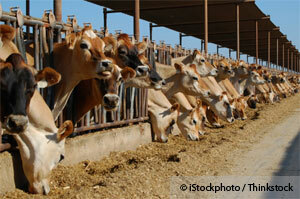 feed producers are blatantly violating restrictions on feed production. Despite a 1997 Food and Drug Administration (FDA) ban on the feeding of most mammalian remains to ruminants, which unfortunately includes significant exceptions impairing the protective intent of the law, a January 2001 FDA report showed that, of 180 renderers, 16 percent lacked warning labels on feeds designed to differentiate those intended for ruminants from those for nonruminants, and 28 percent had no system to prevent the actual mixing of these feeds. The Government Accountability Office issued a follow up report in 2005, noting many program weaknesses in compliance inspections, including FDA’s guidance for inspectors to visually examine facilities and equipment and review invoices and other documents instead of routinely sampling cattle feed to test for potentially prohibited material. Although the World Health Organization called for the riskiest parts of bovine tissues (i.e., brain, eyes, spinal cord, intestines) not to be used in the human food supply or in animal feed to protect from BSE, the United States still allows the feeding of these potentially risky tissues to people, pigs, pets, poultry, and fish. There are few restrictions on the use of animal byproducts, including blood and blood products, gelatin, milk, and milk products, in feeds through which prions may be transmitted. There are no limits on the use of nonruminant, such as pig or horse, remains in feeds, due to an exemption in the 1997 ban. Because prions are so difficult to destroy, if the remains of a BSE-infected cow are fed to a pig or horse and then the pig or horse remains are fed to cows, the cows may subsequently be infected. Similarly, ruminant remains can be fed to poultry and, in turn, poultry feces are routinely used in cattle feed. Americans spend $80 billion each year financing food stamps for the poor, but the country has no idea where or how the money is spent. Food stamps can be spent on goods ranging from candy to steak and are accepted at retailers from gas stations that primarily sell potato chips to fried-chicken restaurants. And as the amount spent on food stamps has more than doubled in recent years, the amount of food stamps laundered into cash has increased dramatically, government statistics show. But the government won’t say which stores are doing the most business in food stamps, and even it doesn’t know what kinds of food those taxpayer dollars buy. Coinciding with lobbying by convenience stores, the U.S. Department of Agriculture, which administers the program in conjunction with states, contends that disclosing how much each store authorized to accept benefits, known as the Supplemental Nutritional Assistance Program (SNAP), receives in taxpayer funds would amount to revealing trade secrets. [NaturalNews] The U.S. Department of Agriculture‘s (USDA) Animal and Plant Health Inspection Service (APHIS) does not even pretend to legitimately evaluate genetically-modified organisms (GMO) before approving them anymore, having recently green-lighted approval for a new variety of “drought-resistant” GM corn produced by Monsanto that admittedly grows no better under drought conditions than natural varieties do. According to the Washington Post, APHIS fast-tracked the corn, known as MON87460, without ever conducting an appropriate environmental risk analysis on the crop’s efficacy, which includes determining whether or not the crop is even safe for humans or the environment. In fact, in accordance with the Obama Administration’s new hands-off approach to regulating GMOs, APHIS decided to actually approve MON87460 even after a cursory evaluation of the data exposed it as a complete failure. “The reduced yield [trait] does not exceed the natural variation observed in regionally-adapted varieties of conventional corn,” wrote the USDA in an earlier report on the crop published last fall. “Equally comparable varieties produced through conventional breeding techniques are readily available in irrigated corn production regions” (http://www.naturalnews.com/032453_GM_corn_USDA.html). MON87460 is the first GMO to be approved with resistance to drought, as opposed to a pesticide or herbicide. And even though many drought-adaptive varieties of natural or hybrid corn already exist, Monsanto is pushing MON87460 on farmers all across the Midwest, and primarily in the Western plains where drought conditions are still severe, with promises that it will translate into increased yields. Based on its initial findings, however, as well as the fact that GM crops are known to contaminate nearby conventional and organic crops, APHIS should have wholly rejected MON87460 and told Monsanto to hit the road. Instead, thanks to embedded special interests throughout the USDA and the highest levels of the federal government, this former regulatory body has become nothing more than a bureaucratic rubber stamp for the biotechnology industry.